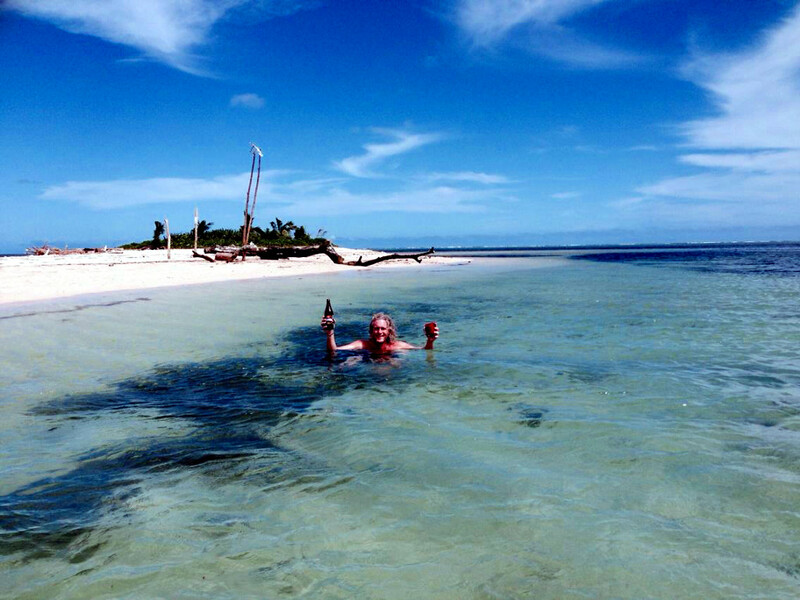 Recently rapidlasso GmbH gave a workshop on LiDAR processing with LAStools at SOPEC in Suva, Fiji following the 2013 Pacific GIS and RS user conference. In the exercises we used LiDAR from the Nadi and Ba basins that had been flown in early 2012 by Network Mapping using helicopters with funding from the World Bank. 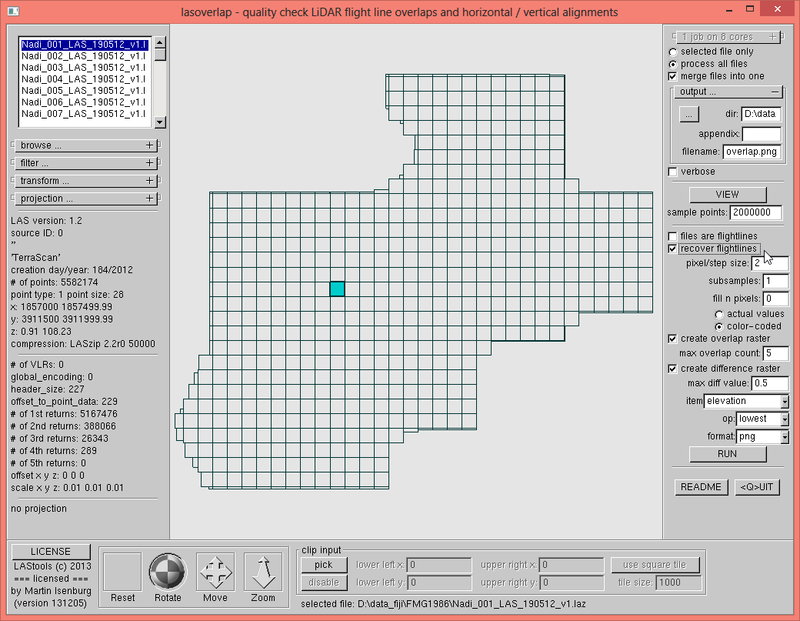 For checking flight line overlap and alignment ‘lasoverlap.exe‘ needs flight line information present in the LiDAR that was delivered as 500 by 500 meter tiles in the Transverse Mercator 1986 Fiji Map Grid projection. 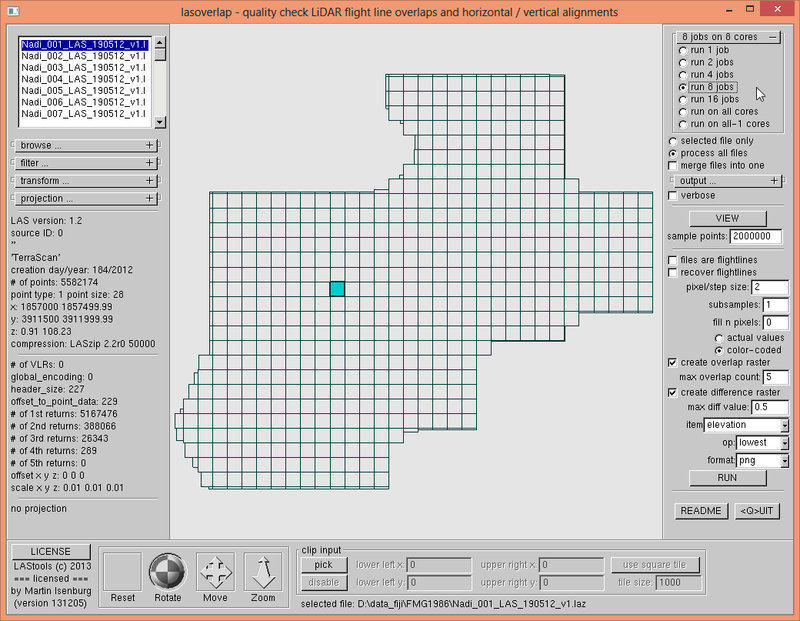 For tiled LiDAR in LAS format the flight line information is meant to be stored in the ‘point source ID’ field for each point. Starting the GUI as shown above loads the 654 tiles (4 GB of LAZ or 30 GB of LAS) and setting the options as shown below creates overlap and a difference images for each of the 654 tiles on 8 cores in parallel. See the tutorial on quality checking for how to run lasoverlap directly on original flightlines. Alternatively we can merge the 4GB of LAZ input on-the-fly by adding the ‘-merged’ option to the command line and by specifying an explicit output file name (although lasoverlap can only use a single core in this case). The resulting overlap image does not entire look like what we expected (note that the image below was downsampled from the original size of 8139 by 7074 pixels). Although some of the helicopter trajectories are visible in the overlap image, the majority of the flight line information does not seem to be populated correctly in the LAZ files. 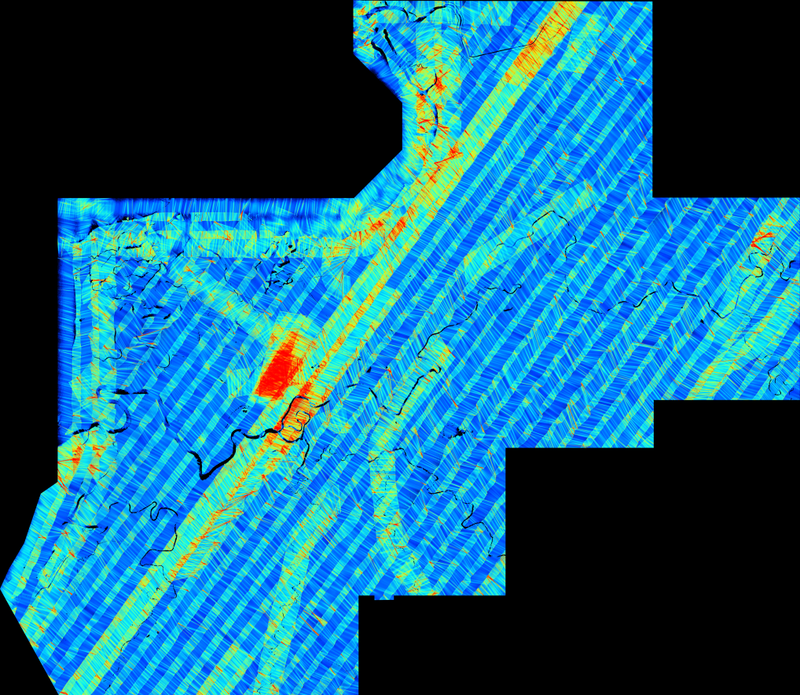 To verify this we quickly generate a density image where flight lines become visible due to the increase in density in areas of flight line overlap. Clearly … the flight line information in the point source ID fields of the LAZ files is incomplete. The points from most of the regular back and forth flights seem to have the same point source ID. One could argue that the lack of correct flight line information should be considered a defect in the delivered data because they prevent the recipient from checking the quality in the overlap and alignment of the flight lines and that the vendor should be held resposible to provide a better data set. This was not the first time we have come across missing flight line information. So we added a new feature called ‘-recover_flightlines’ to the tools ‘lasoverlap.exe‘ and ‘lassplit.exe‘ that uses the GPS time stamps stored with each point in the LAS format to reconstruct missing information about the flight lines. It does, however, rely on the GPS time stamps to be available and correct (e.g. this will not work for the LAS point data format 0 that does not include GPS time stamps). 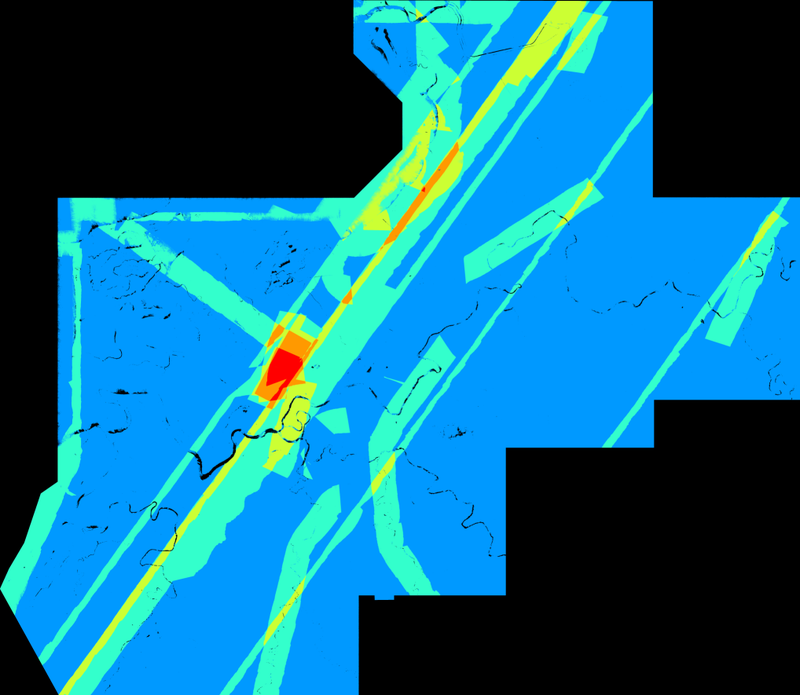 The resulting overlap image shows that the flightlines have been recovered. And now the corresponding difference image also makes sense. It maps the elevation differences of the lowest point in overlapping flightlines per 2 by 2 grid cell to a color between blue (-0.5 meter), white (0 meter) and red (+0.5 meter) and allows to easily spot potential miss-alignments between flight lines. 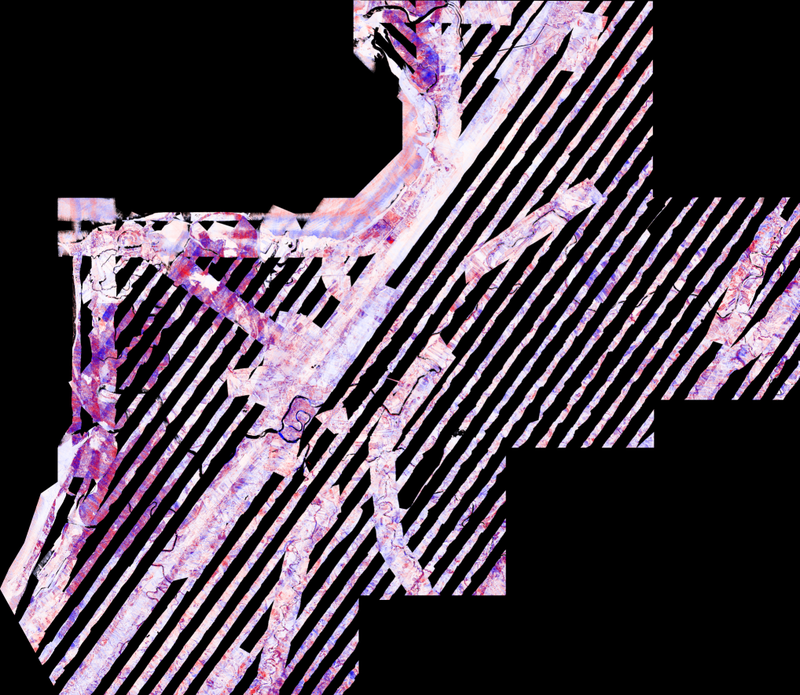 This entry was posted in billions, LAS, LAStools, LAZ, LiDAR, quality checking, raster, tutorials. Bookmark the permalink.